New updated Emergo Train System training material – version 4! There is now a new version of ETS available! 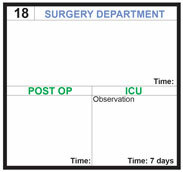 The ETS management cards have a new design that now also shows time on X-ray and Post-op. To the in-hospital patients, a template is included with answers of what the patient needs regarding interventions and level of care. The patient banks are available in different sizes to suit the user's needs. For example the trauma victim bank is available in large (200 patients), medium (100 patients) and small (50 patients). There are now also in-hospital patients (H patients) for Surgery department! More in-hospital patients is developed for ED and ICU. A trigger victim bank have been developed that can be used all over the medical care chain (for example by ambulance, already in ED, or ward). 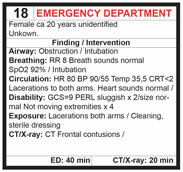 The trigger victim bank contains 50 patients with management cards. During the autumn more training material will be released. For further information, please contact the ETS Competence Center or find out more about the training material version 4 by following the links below.